e’re living in an angry period. Reading my chosen national newspaper on a recent Saturday, I was struck by just how angry the whole front section was. The topics were different – Brexit doom, another stabbing, Mike Ashley’s latest temper tantrum, an unremarkable demonstration of fury in a series of hundreds from the US president, etc – but anger was omnipresent and the common thread. As it is too much in life right now. As a country, as a world, we need a shot of feel-good and can-do purpose. Worryingly, this collective rage reﬂects a collective feeling of impotence that’s hard to shake, like a horriﬁc M25 tailback on the global highway, or the worst bureaucratic tangle you’ve ever encountered, or waiting six months for a roofer to come and repair your roof. What can we do about anything? This thought leads me to a current, related bête noire. Have you noticed the barrage of ‘awareness-raising’ campaigns under way? All about good causes, no doubt, but ‘awareness raising’ assumes no action points, as in “Ah, I now know why X is a worthy cause and can beneﬁt my business. Thanks for telling me.” Awareness isn’t good enough. Awareness is not a commitment. Acknowledgment – understanding, taking onboard – is the ﬁrst step towards commitment. Acknowledgment of the conditions causing anger in our world must be made to make change. Acknowledge, then act. THE RESULTS OF the latest Recruitment Sector Barometer suggest that recruitment companies should consider “doubling down” on the time they spend on business development, according to Alex Arnot, who compiles the Barometer in conjunction with Recruiter. The Q2 2019 Barometer shows conditions in the recruitment sector are becoming “more challenging”, says Arnot, with an increase in the number of respondents citing the economic performance of their sector as contributing to a tougher trading environment. In these circumstances, and “with the scarcity of candidates easing slightly”, Arnot, who is an adviser to more than 30 recruitment companies, says that increasing business development activity could be a good option for staffing businesses. Despite the environment caused by Brexit uncertainty, which “is delaying hiring plans in all areas of the economy”, Arnot says the latest Barometer results “remain solid, with a net positive of respondents expecting growth and year on year increases in proﬁt”. However, the results show a deﬁnite dampening in sentiment, reﬂected across the Barometer’s metrics: Although still in positive territory, the Arnot Score, a measure of industry optimism, has fallen to its lowest level since the Barometer began in Q4 2016. There was no segment of recruitment – across contingent, executive search, permanent, temporary, or contract – in which directors expected their businesses to perform better in Q3 2019 compared with the same quarter last year. Fewer than 10% of recruitment ﬁrms have raised their fees in the last 12 months. The net percentage of recruitment companies hitting or exceeding their revenue or proﬁt target for the most recent quarter has fallen to the lowest levels since Q1 2017. Although Arnot acknowledges that Brexit uncertainty is having a negative effect on the sector, he remains optimistic: “Once the current impasse is resolved there is every chance that employers will need to accelerate their growth plans again,” he says. When that will be is, of course, anyone’s guess. THE ASSOCIATION OF Professional Staffing Companies (APSCo), Cranﬁeld University School of Management and Grant Thornton are collaborating on the design and delivery of an executive MBA in human capital that will welcome its ﬁrst cohort in September. Aimed at “the whole of the talent eco-system” – including agency and in-house recruiters, technology specialists and HR and recruitment process outsourcing professionals – the executive MBA meets the requirement of the Level 7 Senior Leader Master’s Degree Apprentice Standard. It was modelled on an existing Cranﬁeld MBA for the defence export market, and replaces an MA in HR that Cranﬁeld previously offered. STA RT-UP OF THE MONTH THE THRIVE TEAM Search-and-selection specialist Martin Grady and experienced HR professional Alison Trodd have joined up to launch The Thrive Team, a search-and-selection, transition coaching and training provider. Grady brings a 20-year search and selection background to the new business, having worked for firms such as Stonehouse Search and Selection, Hawker Chase Executive, ARM Consulting, MEG Recruitment Solutions, Matchtech and Manpower. Trodd has been in HR for more than 30 years, working for the NHS, the BBC, Boots and Butlin’s. The Thrive Team places senior leaders in roles commanding salaries of between £80,000 and £200,000, says Grady. But its support of the candidate does not stop when the placement has been made. Once a candidate accepts a role, the firm transitions them into that role during their gardening leave and notice period through coaching, so that they can be immediately effective in their new role. This coaching can cover a range of topics including emotional intelligence, their wellbeing – including mental health awareness – and issues they may have at home. Estonia is renewing its efforts to recruit IT professionals and match them with top tech companies operating in the country. In August 2018, an alliance of Estonian organisations launched a recruitment campaign entitled Career Hunt, in partnership with a number of IT companies. The campaign aimed to find technology specialists from the UK and encourage them to apply for senior positions at tech industry firms, such as Microsoft and Skype. This year Estonia is once again welcoming tech specialists to apply for interview. Those who pass the initial screening rounds in their interviews will fly to Estonia for a five-day all-inclusive tech tour including exclusive VIPshortcuts for job interviews. And in an interesting footnote, Estonia has almost become a victim of its own success as being a leading global hub for tech start-ups. Work Estonia reports there is a massive shortage of office equipment needed to furnish the growing number of co-working spaces and company headquarters in the capital Tallinn. “We need hundreds of chairs for new employees, but even IKEAs in neighbouring Latvia and Finland can only offer us a combined weekly supply of 20 chairs,” says Kaarel Kotkas, CEO of online identity verification company Veriff. With this latest drive from Career Hunt, Recruiter is predicting a rise in start-up furniture manufacturers in and around Tallinn in the coming months. WATCH OUT FOR THE WARNING SIGNS OF ADDICTION, RECRUITERS ARE ADVISED Recruiters have been urged to be alert to the warning signs of cocaine dependency among their workforce due to the “massive problem” the sector has with consultants taking the Class A drug. Research by Public Health England revealed a 19% increase in the number of adults starting treatment for crack cocaine addiction in the last three years. Late last year, Recruiter revealed ﬁndings from The Cabin, a leading addiction facility in Thailand, which showed cocaine was the number two substance addiction treated among their UK clients. And speaking to Recruiter, April’s Recruiter cover proﬁle Paul Flynn said he thinks the recruitment sector has a “massive problem” with consultants taking the drug. Touching on the scale of the problem, Flynn told Recruiter: “Anyone who runs an urban-based recruitment company – notably a London, Manchester, Birmingham-type company with staff between the age of 22-40 – could ﬁnd cocaine will be getting used in their company in the week, on a night out or in some kind of social setting.” Flynn urged recruiters to look out for indicators that people may have a problem with cocaine dependency. These include frequently failing to turn up for work on Monday or Friday, a stressed negative attitude on Tuesday, heavy drinking and an erratic way of communicating with fellow workers. NEW RULES ON PAYSLIPS COULD LAND RECRUITERS IN TROUBLE Failure to comply with two amendments to the 1996 Employment Rights Act coming into force from 6 April could see recruiters run the risk of being named and shamed by government for failing to pay the National Minimum Wage. Stephen Jennings, partner solicitor at Tozers Solicitors, explains that two amendments to the Act ensures that employees and workers, including those under casual or zero-hours contracts, must receive correctly detailed written, printed or electronic payslips. Jennings told Recruiter the rules apply to all workers, not just employees, including agency workers and zero-hours workers – anyone other than the genuinely self-employed. In 2018, eight recruiters were among hundreds of employers named and shamed by government for failing to pay NMW. CONTRACTS & DEALS Cornerstone OnDemand Global industrial and consumer business group Henkel has selected Cornerstone OnDemand’s Learning, Performance and Recruiting suites in a bid to bolster training of staff and improve employee engagement and efficiency. Oberon Solutions Recruitment, payroll and HR services provider Oberon Solutions has secured a “significant” funding package from Lloyds Bank Commercial Banking. Lloyds Bank CB has provided Oberon with a working capital facility that it says will support cashflow, enabling the business to focus on expanding its client base. The Winchester-based firm plans to grow by more than 300% over the next 12 months and the business expects to create up to 90 jobs over the next two years. Remit Group Training provider Remit Group is to partner with Hewlett Packard Enterprise (HPE) to recruit and train eight new IT sales apprentices at its new office in Circle Square, Manchester. Remit Group currently supports HPE’s apprenticeship programme at its Bracknell office and will recruit these new apprentices to work in its inside sales department, while undertaking the IT technical sales Level 3 apprenticeship standard. Ferris Slater Ferris Slater, a cyber security recruitment & cyber security training provider based in the North-West, has been awarded £30k funding by Rosebud, a subsidiary of Lancashire County Council and the EU Development Fund. The firm says the funding will drive growth across both its cyber security recruitment and cyber security training services. new locations, across five separate counties: Bedfordshire, Cambridgeshire, Hertfordshire, Norfolk and Suffolk, as well leading on delivery of integrated healthcare services in to HMP Chelmsford. Simply Jobs Boards Simply Jobs Boards has joined the Northern Powerhouse Partners programme. The programme, which has a membership made up of institutions and businesses across a range of sectors, aims to promote major projects and initiatives in the North, and works to enable cities and towns to pool their strengths in order to thrive. Sirenum UK-based technology solutions provider for temporary staffing agencies Sirenum has entered a strategic partnership with Wagestream. Wagestream enables workers to withdraw earned pay in advance of payday for a one-time fee. ProActive Rail, a provider of staff to the transport industry in Greater London, is the first joint customer of the two businesses to take advantage of the integration. Become an FCSA Supply Chain Partner. Join the growing list of recruitment agencies who are committing to a preferred supplier list comprising exclusively of fully compliant and transparent FCSA Accredited Members and signing up to our Supply Chain Partner Charter. • Kittenfishing (experienced by 30% of jobseekers) – Making the job seem a bit better than it really was to grab a candidate’s interest. • Catfishing (29%) – Making the job seem a lot better than it actually was, to the point where the job description didn’t match the reality. • Rostering (25%) – Keeping the candidate waiting for ages before letting them down because they were actually the second-choice candidate. • Slow fade (24%) – Gradually paying the candidate less and less attention over time. • Ghosting (23%) – Suddenly ignoring the candidate and cutting off all communication. • Submarining (23%) – Ignoring the candidate for a certain amount of time, then reappearing like nothing happened. • Player (21%) – A recruiter who promises someone they’re the lead candidate while speaking to others. was the only candidate but was actually speaking to others on the side. • Being clingy (16%) – Contacting the candidate too often/won’t leave them alone. • Stalking (15%) – Knew all about the candidate from their social media feed even though they’d never spoken. The deployment of AI can drastically revamp the recruitment process, which is so ripe for disruption, given the array of bad recruitment practices that are reported across the board. As AI is expecting to create $13tn in value for businesses by 2030, there’s never been a better time to embrace the latest developments. Collectively, a third of job hunters go through agencies and/or recruiters and experience numerous bad behaviours while job hunting. These notorious behaviours have a close resonance to millennial dating sins such as ghosting, catfishing and stalking. As the disconnection between jobseekers and recruiters widens, the use of AI will pave the way for increased trust, accuracy and transparency, eliminating the bad habits that have slipped into day-to-day practices in recruitment. As AI hits the sector these factors must be at the forefront of most business agendas, ultimately revamping the job-hunting process for both the jobseekers and companies seeking better results. IS YOUR BACK OFFICE GDPR COMPLIANT? WHETHER YOU ARE RUNNING A BACK OFFICE BUILT ON SPREADSHEETS AND EMAILS, OR USING ENTERPRISE GRADE CRM ENGAGE CAN HELP YOU ACHIEVE GDPR COMPLIANCE. Aside from GDPR compliance, the Engage Back OfƂce Solution can also eliminate your administrative overheads resulting in increased margins. ENGAGE WILL: 1. Help you clean up your current candidate records - we can advise you on the rules to apply when deciding which records you can keep and for how long. 2. Provide you with a GDPR compliant ongoing database solution. Replacing your current pay & bill, software licences, hardware and other back office costs. Creating a single minded, front-ofƂce orientated organisation with improved business development capacity. For anyone marketing themselves online, video has become impossible to ignore. It has long been used on corporate and agency sites but not always in the most imaginative or powerful way. Historically, video has been expensive but platforms such as HireCast from Enhance Media and Hinterview are making it more accessible and much easier for recruiters to exploit its beneﬁts. more adept at using this powerful medium than they are. major employers such as John Lewis and Mott MacDonald. Video isn’t just for organisations to market themselves and their jobs but for individual recruiters, too. Hinterview offers a video-interviewing platform and its tools are also used for business development and pitching to clients. “But what we’ve seen recently is recruiters are using it as a tool to market themselves on LinkedIn and create brand awareness for their agency,” says Andy Simpson, CEO and co-founder of Hinterview, adding that ‘Hintros’ are typically 40 secs to a minute long. TA in-house, they had really done so with a lot of their HR staff, which was ﬁne; it worked a bit but then they didn’t have the full TA knowledge and expertise.” Candee soon set to work to rectify this, and within the ﬁrst eight months, Nigel Barker and Bonnie Grant had been hired as regional talent leads for Europe and North America respectively. Also hired was executive talent lead Julia Markell, who heads up the new in-house executive search function. proposition (EBP). “Historically, we haven’t done a lot about describing the employee experience,” explains Beech. However, assuming the new EBP gets board approval, the public will see employees as brand ambassadors, telling their stories about what it is like to work at Mondelēz. “We have loads of fantastic stories to tell. We are just not doing a great job telling them,” adds Beech. Following the restructuring, Beech is also exploring ways of better incorporating local needs into EBP. For instance, it’s difficult to get women into sales roles in India, where cultural norms discourage women from such careers. So a localised approach to attracting women to sales jobs there might stand a better chance of success than “a blanket campaign around driving awareness in sales across the organisation”, Beech says. However, she says, “it’s a new way of working for us, and we are all learning as we go. It’s ﬁnding a way to ensure that our ears are open to local needs”. AWARDS CEREMONY 30 OCTOBER, THE BREWERY. 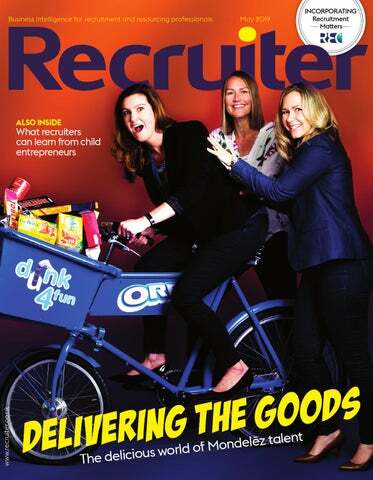 “We are on a brilliant journey, but we have a huge energy and passion around us, and I think the sky is the limit” Mondelēz recruiters across the globe. A new global customer relationship management (CRM) system was also installed. Looking ahead, Candee is looking forward to the introduction of Workday, which she describes as “the full human capital management system”, in 2020. Building governance Alongside the more operational aspects of TA, Candee appears most exercised by the effects of the recent restructuring on global strategy and governance, “the ways of working with all of these different locations and regions, and global versus local, and particularly how do we all partner and work together and not be siloed, and work in an integrated fashion with talent management. “The challenge is that we have been a very centralised function, but now you have folks that report into different people [within their own business units].” Candee says it is essential that governance is “very clear about what needs to be global and what needs to be part of a global function”. YOU WANT TO START YOUR OWN BUSINESS? HERE IS A PROVEN SOLUTION! Among the aspects of TA that Candee says must remain global are those that maintain efficiency and effectiveness, such as global end-to-end processes, global technology and the global employer brand. The key is to provide that local agility, Candee says, while at the same time ensuring that “the guardrails of global tools and technology are in place to provide the consistency we need as a large multinational even at a local level”. Candee was heartened by the reaction of the TA practitioners around the world, who told her they feared they would lose their connection with the global TA function as a result of the corporate restructuring. “I was thrilled… because it meant that we did build something great, and I was able to tell them ‘That’s not going to go away’, and that is beautiful,” she says. the case of Mikaila Ulmer, founder of Me & the Bees Lemonade. Drew Welton, MD at Bamboo Crowd, a recruitment company that specialises in innovation consultants and growth strategists, thinks children are able to be bold and ambitious because they are not afraid to put their ideas into action. They are not held back by fear of the unknown or by ﬁnancial commitments, such as mortgages. “Part of the beauty of these young entrepreneurs is that they have no fear. Rather than being held back by industry norms, they are able to run with an idea and just go for it. They don’t over-think things.” Something that also works in the younger generation’s favour is their familiarity with technology – social media in particular. “This generation are so plugged into social media,” says Drew. “They really understand the power of it.” As tech is driving innovation in every sector, recruitment included, understanding its potential is very important. Simon Chuter, innovation adviser at the Sussex Innovation Centre, agrees with Welton that children are unencumbered by fear, and are therefore free to innovate without constraints. They automatically see the possible and believe it will happen, rather than looking for pitfalls and worst-case scenarios. “Children don’t have ideas and think of all the reasons why it wouldn’t work,” he says. “They ﬁnd reasons to do things and look for the positive. Adults, however, can suffer from paralysis by analysis. They look for so much data, research and validation that they don’t take an idea forward.” To be a successful innovator, you need to have ﬁve key skills, according to the authors of The Innovator’s DNA: Mastering the Five Skills of Disruptive Innovators. Those ﬁve skills are: associating, questioning, observing, experimenting and networking. Chuter says children are innately good at these ﬁve skills, particularly the ﬁrst four. Observing This is about looking at how something happens. Chuter thinks children are very good observers and at looking at problems from a new, fresh angle. In the business world, this means observing what is going on for customers – what are their key issues? What works for them? What doesn’t? “When you can ﬁnd a value proposition that meets a customer needs, that’s the holy grail,” says Chuter. When children have an idea, they naturally want to test it out and they don’t just test it once or in one particular way. They keep at it, often trying lots of different permutations. “Children want to play with an idea and see how it can be done,” says Chuter. Networking tends to be viewed as something that adults do, consciously. When it comes to innovation, though, adults can be held back by a desire to keep their ideas to themselves – in case someone else steals their idea or out of fear or being laughed at. If children have a good idea, however, they want to share it and solicit feedback. This is essentially, unconscious networking. “While networking is the most adult trait in The Innovator’s DNA, children actually feel less precious about sharing,” says Chuter. t’s taken longer than anticipated but the government has now published its IR35 ‘Off Payroll Working Rules’ consultation. This sets out several proposals for improving the reform, before the changes come into effect for the private sector in April 2020. The REC has consistently argued that agencies should not bear responsibility for a client’s decision on who falls into IR35 status. The consultation includes some movement on this, with the government saying that liability for unpaid tax and National Insurance Contributions will rest with the party that did not fulﬁl its obligations. Details on this issue include: • Possible legislation to make it mandatory for end clients to share their IR35 determination – and the reason for it – with the worker. • To demonstrate compliance, all parties will be required to communicate the IR35 determination of the contractor to the next party in the supply chain. • HMRC will go after the end client if: • the end client is the one who failed to give the correct determination/provide the evidence for that determination • the end client failed to communicate the IR35 determination of the client to the agency • the end client is the only entity in the supply chain operating in the UK. The government has also proposed that small companies in the private sector should be exempt from having to determine the IR35 status of individuals and is using the consultation to clarify how this applies to non-corporate entities. This means agencies supplying the contractors are likely to need to systematically check the status of the client they are providing services to. the view... Here’s a question to ponder, says NEIL CARBERRY, REC chief executive: what will recruitment look like in 20 years? According to the ONS, in 2016 the gap between the UK’s productivity and that of the other six G7 countries, in terms of GDP output per hour worked, was 16.3%. The gap widens to 26.2% when comparing the UK with Germany. slump in the years since from 2007? There are many factors at play, but one issue is the UK’s poor track record of investing Sustained, targeted investment is in training and skills. A recent study needed, both from the government by the Social Mobility Commission and the private sector, if this issue reported that the UK has relatively is to be resolved. Recruiters have a low spending on vocational skills part to play in this. As the experts compared to its main competitors. on their local labour market, they In fact, the UK remains below the EU are in a unique position to provide average on the proportion of GDP information about where the skills spent on training and education, the shortages are and where activity proportion of employees accessing needs to be targeted. The REC training, and spending per supports them in doing this employee on training courses, through comprehensive as well as other measures. research and timely Government spending on data, and its campaign adult skills also appears activities focus to be falling over The growth on empowering time, and this lack in UK recruitment agencies of investment is reﬂected in productivity the British workforce’s skill between 2007 to upskill the country’s temporary workforce. In turn, levels – England was ranked and 2016 this will allow them to ﬁll the 14th for literacy and 18th gaps in the labour market and for numeracy by the OECD’s boost productivity. Survey of Adult Skills. those most challenged by debtor days – the upper quartile – saw the average rise from 52.1 to 64.3. As market uncertainty is set fair to continue, the importance of benchmarking performance against other recruiters to maximise performance cannot be underestimated. BELINDA JOHNSON runs employment research consultancy, Worklab, and is Associate Knowledge & Insight Director of Recruitment Industry Benchmarking (RIB). The RIB Index provides bespoke conﬁdential reports on industry benchmarks and trends. See www. ribindex.com; info@ribindex.com: 020 8544 9807. The RIB is a strategic partner of the REC. How recruiters can help create the next generation of leaders The fast-changing world of work means it has never been more important to ﬁnd leaders and managers up to the job. But where do you start? he UK currently has too many untrained managers and leaders ill-equipped to tackle the catalogue of challenges facing business today. Improving productivity and driving business growth; responding to technological change, economic uncertainty and Brexit risks; ﬁnding talent and supporting employee wellbeing; they are all dependent on a new approach to leadership. The REC’s latest Future of jobs whitepaper, ‘Leadership 2025’, explores what this looks like. on just about anything about an organisation. This will free up managers to focus on areas where human judgement is required. But it puts good judgement skills in the spotlight, and managers will need a more people-centric style and the ability to think ahead. And the increasing emphasis on project-based work – characterised by collaboration and complexity, innovation and creativity – requires not only strong leadership, but also leaders to be team players. provide candidates support. Insight from those networks is now being used to help its clients shape their own recruitment and development strategies. Driving good recruitment at all levels Innovation in senior level recruitment will be as important as ever, so the pressure is on executive search ﬁrms to get it right. But recruiters need to drive good recruitment practice at all levels to make a real difference. And that includes working with schools and colleges to create a grassroots talent pipeline. EIGHT WAYS RECRUITERS CAN HELP 1. 2. 3. 6% – the number of top management positions held by BAME employees, despite them making up 12.5% of the UK population In response to a key recommendation from the Future of Jobs commission, the REC set up its Future of Jobs Ambassador network. This is designed to build a bridge between education and the world of work, by giving recruiters the opportunity to play a proactive role in providing work experience placements, jobs, advice and coaching. But it needs more businesses to get engaged, and young people still need more visibility of the different jobs and career paths on offer. Practise what you preach Importantly, recruiters also need to inspire clients to change by being great leaders themselves. If clients can see recruiters who are genuinely passionate about their role and in it for the long haul, fostering longterm relationships with openness and honesty; if they can see their partners adapting to the changing business environment and embracing best practice, they will listen to the advice they have to offer. This opens up the opportunity for recruiters to play a genuine consultative role. But to do so, recruiters need to demonstrate their understanding of the sector and their client’s needs. And they should be able to provide the bigger picture around the external political, regulatory and labour market developments that will impact on clients and hiring activities. Effective workforce planning must become the norm. And by prompting clients to look ahead, recruiters will be giving ﬁrms a ﬁghting chance to secure the future leaders with the right skills to battle any challenge that comes their way. • It is now acceptable to use a short-form birth certiﬁcate or adoption certiﬁcate as proof that an individual has the right to work in the UK. With regards to the online checks, these are currently only available to non EEA nationals who hold either a biometric residence permit or a biometric residence card, or EEA nationals with a passport or national identity card with settled to pre-settled status. The online checking service works by allowing individuals to view and share their Home Ofﬁce right to work record with relevant parties, which the prospective employer and recruiter will ﬁnd useful. In order for the check to be sufﬁcient to establish the statutory excuse, the person performing the check will need to retain evidence of the fact that an online check has been done. This can be done by saving or printing the ‘proﬁle’ page of the individual, including their picture, conﬁrming their right to work in the UK and retaining this securely to provide as evidence in the case of illegal working allegations. The other change means that it is no longer a requirement when using a birth or adoption certiﬁcate as part of a right to work check for the certiﬁcate to be the long-form version. Employers and recruiters will now be able to also use short-form certiﬁcates, but should still note that the certiﬁcate alone will not be sufﬁcient evidence of right to work. In order to be valid, the certiﬁcate must be combined with an ofﬁcial document which gives the individual’s UK National Insurance number and their name, and was issued either by a government agency or a former employer. These two changes came into force on 28 January 2019 and this article is only applicable to checks carried out from the above date. professionals in a variety of roles supporting international infrastructure projects. This creates numerous challenges relating to the remuneration of contractors and staff, especially in emerging markets. In response, Cardno tested several payment methods, particularly in countries with underdeveloped ﬁnancial infrastructure where employees were forced to carry large amounts of cash across borders. Atlas Pay GTP, which has bank partnerships in over 30 countries, is implementing a prepaid MasterCard programme with Cardno, enabling them to transfer funds to staff and contractors quickly, easily, and securely. The Atlas Pay GTP programme also gives Cardno increased control over the expensing of those staff, reducing the time and cost required for internal administration. I realise I’m continually developing, and my team are too. It never stops. You’ve been recruited to develop the FR Exec arm of Forward Role. What do you want to achieve? Forward Role is already a highly respected brand in the sector, with a mix of high growth private-equity backed businesses and large FTSE clients. I joined because I was impressed by their delivery record, and the way they combine state of the art tech with traditional search methodologies. My remit is to continue to scale the proposition into the transformation and change sectors and wider PE market. Finding capable leaders in the current climate is difﬁcult. It’s where having a big network is important, as is taking a personal interest in hunting out success stories. But don’t necessarily judge a candidate by their last performance either – different styles suit different jobs. It’s why I won’t put someone forward without meeting them ﬁrst. CVs can’t beat the personal touch. Getting a sense of what they’re about and how capable they are is vital for getting the right ﬁt for both the candidate and the company. been in high demand. Some clients talk about transformation and the desire to change, but it’s when a client truly commits to change and can clearly articulate the strategy that they have the opportunity to create the most compelling story for the market and engage with the best change leaders. You’ve had several roles working in-house as a recruiter, how much does that help? You should never underestimate the importance of understanding the vision, objective and culture of your client, while knowing your clients’ competition, strategy and the broader market. Working in-house has enabled me to see far beyond a one-off hire and has widened my perspective on offering different solutions, the need to track talent and the importance of becoming a trusted partner. Membership Department: Membership: 020 7009 2100, Customer Services: 020 7009 2100 Publishers: Redactive Publishing Ltd, Level 5, 78 Chamber Street, London E1 8BL Tel: 020 7880 6200. www.redactive.co.uk Editorial: Editor Pip Brooking Pip.Brooking@rec.uk.com. Production Editor: Vanessa Townsend Production: Production Executive: Rachel Young rachel.young@redactive.co.uk Tel: 020 7880 6209 Printing: Printed by Precision Colour Printing © 2019 Recruitment Matters. Although every effort is made to ensure accuracy, neither REC, Redactive Publishing Ltd nor the authors can accept liability for errors or omissions. Views expressed in the magazine are not necessarily those of the REC or Redactive Publishing Ltd. No responsibility can be accepted for unsolicited manuscripts or transparencies. No reproduction in whole or part without written permission. Code Nation’s pledgers include AO.com, BAE Systems, N Brown Group and Moneysupermarket Group. Code Nation courses are divided into two categories. The ﬁrst, Develop Your Skills courses are subdivided into two subjects: software development and cyber security. Mainly aimed at unemployed people on beneﬁts, these students are often joined by employees sent by their companies. The ﬁrst Develop Your Skills course started in Chester in November 2018. Develop courses last for three weeks. According to Lord, 100% of those who started these courses have completed it, ending up with a qualiﬁcation equivalent to a GCSE – for some, he says, “the highest educational qualiﬁcation they have ever had”. The second category is Master Your Skills courses. The ﬁrst Master course in software development is already up and running. The ﬁrst Master course in cyber is due to start in July. Master Your Skills courses run for 12 weeks. CO D E N AT IO N B O OT C A M P A W IN N E R Man Lee Cheung from Bolton says Code Nation’s boot camp-style learning approach has paid dividends, enabling her to secure a junior developer apprentice role at AO.com. Not only did Code Nation help her with funding, by securing a BAME scholarship that allowed to complete its 12-week Master coding course, she says the way the course was run really worked for her. “I found the subject hard to learn independently, so the boot camp style learning is what I needed to sink my teeth into it.” Cheung says the one-to-one support provided by Code Nation staff, which included helping her secure an apprenticeship at AO.com, also made a big difference. SOCIAL NETWORK WHAT HAVE YOU BEEN UP TO? GET IN TOUCH! Staff at Athona Recruitment raised £11,035.28 for Alzheimer’s Society last year. Tina London (below, right), director of Athona Recruitment, hands over the cheque to Mussara Gray, Alzheimer’s Society community fundraiser, Essex. Staff from Horsforth (near Leeds)-based recruitment company Futures dressed in red and took part in a mass bake sale on Comic Relief Day [15 March]. BBC Radio Leeds joined them to test their baking live on air and spoke to them about their fundraising. The firm raised £256, which was then matched by managing director Tom Liptrot to make a total of £512. CLASS PEOPLE BRING BOOKS TO LIFE FOR PUPILS Staff at education recruitment specialist Class People may no longer be at school but they have continued their tradition of dressing up and being silly to raise awareness for World Book Day. Gethin Roberts, owner and MD at Drivers Direct, hands over the cheque to Janette Drew, community fundraising manager for the NSPCC. DRIVERS DIRECT STAFF HAVE A BALL TO RAISE FUNDS FOR NSPCC Provider of temporary and permanent drivers to commercial organisations Drivers Direct has raised £2.5k for children’s charity the NSPCC at the company’s annual charity ball in London. MINDSET, RATHER THAN SKILL-SET, is the necessary focus of leadership today. As technology-driven change gathers pace, some companies are taking advantage of the wave of disruption, while others are overwhelmed and heading for extinction. It is predicted that 40% of current Fortune 500 companies will cease to exist within the next 10 years. To assess what it takes to stay ahead, I interviewed 70 leaders of top global companies for Asia-Paciﬁc with combined revenues exceeding $1tn (£760m), mostly regional CEOs but a few CEOs of Western multinational companies based in Asia. The idea was to ﬁnd out how they are being disrupted, what they’re doing differently to ensure future success and how leaders can stay effective in a world where the pace of change is unprecedented. Many of the CEOs said that ‘at least half’ of their senior management teams were totally unsuited to the current business environment. While they had the skills and experience, these senior executives were inclined to stick with known strategies rather than seeking to innovate and lead their businesses through disruption. It’s not possible for every large company to replace half of its management team –half the world’s management workforce would suddenly become redundant. Finding good talent is already hard and halving this pool would be disastrous. But managers need to do more than simply adapt to digital transformation – they need to pivot the disruption itself and take it further. First steps, long game It seems people fall into three groups: welcoming change and progress; not welcoming change, but willing to come along; resistant to change. So you might think the answer is to coach and retrain the second group and eject the third. But unfortunately there’s no way of knowing who ﬁts into which group until their effectiveness is tested – and that doesn’t show up in any interview or CV. The task is much more demanding; we have to predict the mindset of a person from subtle clues and through assessment tools. As a result, the relevance and precision of assessment tools is growing as companies begin to look at mindset above skill set, both to look at existing employees and to assess new hires. Leaders who welcome change, and those who react, are experimenting with new business models and setting sail into uncharted waters. ASK THE EXPERT I’m billing £600k and am thinking of setting up my own recruitment business. What advice would you give me? Growing your own agency is among one of the most satisfying feelings there is. As a strong biller you will likely have many of the attributes needed to build a recruitment business but the more the agency grows the more new skills you will need to acquire or bring in to support you. At start-up stage, one big biller makes a huge difference to the bottom line as well as setting the standard for the rest of the team. Each biller’s contribution reduces as a percentage of total revenue as the company grows and for the founder(s) that means the leadership role becomes increasingly important and time consuming. • Drive – Until a recruitment company hits say 20-30+ employees, when you tend to have more management support, the demands of running the business can feel relentless and require boundless energy. You will be constantly planning, ﬁghting to keep your best staff, looking for better staff to hire, mentoring, building new business etc. It is all consuming. • Decisive – There are so many pressures on a recruitment company director’s time that leaders need to be decisive. Plans need to be focused and executed without distraction or detour; all activities need to be prioritised so that time is spent where it will deliver most value; money needs to be spent where it will deliver the greatest long-term reward; changes in course need to be decisive but occasional. • Accountable – SME recruitment leaders expect to grow their business every quarter but the more the company grows, the more reliant they are on others to deliver that growth and sometimes individuals will fall short. The best leaders recognise that the responsibility for missing target is theirs – they are accountable for recruiting and retaining staff, for motivating consultants, for providing the tools and training consultants need etc. s a diligent Recruiter, you no doubt have a process in place for making Right to Work checks and you’re aware of the risks of employing illegal workers. But the first step in any Right to Work process is to ensure that the documents you’re seeing are genuine. And this is no easy task, with countless different identity documents issued globally and many thousands of fraudulent ones in circulation. the total fake documents. As our chart shows, our technology also identified a large number of French, Portuguese, Nigerian and Dutch documents. At TrustID, our technology helps our customers check hundreds of thousands of identity documents annually. We regularly analyse our customer data to highlight trends across industries and fraudulent document types and over the last 2 years, our analysis shows that the need to have a robust and reliable document validation process has never been greater. Read on for some highlights from our recruitment customers’ data: 1) The number of fraudulent identity documents continues to grow. In 2018, the expert document analysts in the TrustID helpdesk team saw a 55% increase in the number of fake and fraudulent identity documents identified by our technology, compared to 2017. But the growth in fake IDs from the recruitment sector grew even faster, at 83% year on year. 2) Recruitment agencies see a high proportion of fake documents Our customers in the recruitment sector continue to find a significant proportion of the fake documents: in 2017, recruitment agencies accounted for 19% of all fraudulent documents whilst in 2018, they made up 22%. In fact, recruitment, construction and payroll / umbrella services have been the highest referring sectors for the past 2 years. 3) Fraudulent IDs come from all over the world Last year, our recruitment customers identified fraudulent ID documents purporting to be from 26 different countries across Europe and beyond, particularly passports, visas, ID cards and biometric residence permits (BRPs). 4) If at first they don’t succeed… In our experience, when a candidate unsuccessfully tries to gain employment using a fraudulent ID, they may simply head down the road to the next employer or recruitment agency and try again. Our helpdesk team have seen one particular identity document 5 times from 5 different customers. “I get to go to some awesome places and meet some super-interesting people” MY BRILLIANT RECRUITMENT CAREER What was your earliest dream job? A pilot – at 15 I joined the air cadets for or a few years and watched d Top Gun. I’ve logged about 35 hours in a light aircraft under instruction. ion. My plan wass to move to the Caribbean an and ﬂy tourists ourists on island hops ops around the peninsula. nsula. What was your first job in recruitment ment and how did you get into it? What would you consider to be the most brilliant moment o of your career? Who was your role model in life or recruitment? Elon Musk – I admire his ‘never-give-up’ attitude and the margins of risk that he operates under. He reignites our desire to explore and achieve the impossible, making it possible. What do you love most about your current role? Engagement with people is what it is all about. I’m on site every week and love nothing more than walking on to a project, hearing about industry experiences, the historical elements of the building... I get to go to some awesome places and meet some super-interesting people. What’s your top job to fill at the moment? We have key workstreams in retail and distribution needing senior-level project managers inside the M25. What’s your signature dish? I don’t cook. But if I did – stew and dumplings, even in the summer! Laugh or cry: what did your most memorable candidate make you want to do and why? I was on site and encountered a lad who told me he was just a labourer. I asked him what he wanted to do and he said he wanted to be site manager. We asked the site manager what he did to get the job, and he told us he went to night school when he was an electrician, qualiﬁed and gained experience as a site manager. The labourer in question became an assistant site manager 18 months later and works with us freelance – not bad for just a labourer. What would your theme tune be? You’re the Best from The Karate Kid ﬁlm. 3R The recruitment start-up specialist provider has appointed Oli Gokgol as business improvement manager. to regional director for Canada. BOLD IDENTITIES The Yorkshire-based recruitment sector web developer has appointed Mike McGloin as US director. CORDANT PEOPLE The Cordant Group ﬁrm has promoted Dana Cripps from brand manager to brand director. Cereal and snacks giant Kellogg’s has promoted talent and diversity director for Europe Ben Lamont to HR director for Kellogg’s in the UK and Ireland. Lamont started his career in ﬁeld sales at FMCG [fast-moving consumer goods] giant Pepsico. Following a nine-year stint at Pepsico, which included a decade as a talent acquisition manager, he moved to Kellogg’s in Manchester, becoming a manager in its organisational effectiveness team before working his way up to European recruitment and diversity manager. He then went on to lead the company’s talent and diversity activity across the continent. E1EW David Liddle joins the multi-sector recruiter as senior recruiter, engineering and trades. DELTRA GROUP The programme, project, and change staffing specialist welcomes new associate director Abdul Yoki. Executive public sector recruiter welcomes Julia Roberts as head of its education and not-for-proﬁt practice and Chris Bernard as partner within its regulation practice. ﬁrm has appointed eight new consultants across its offices worldwide. These are: Chris Careccia, partner in Miami Beach/New York; Valerie Corradini, principal in San Francisco; Nancy McGee, principal in San Francisco; Samantha Smith, principal in New York; Matthieu Galian, principal in Paris; Ming Luo, principal in Beijing; Jiat-Hui Wu, partner in Singapore; and Ed Zheng, partner in Shanghai. MARLIN HAWK The global executive search ﬁrm welcomes client partners Carrie Magee, who is based in Atlanta, and Ricky Lam, who is based in Hong Kong. RANDSTAD The recruitment giant has appointed Rebecca Henderson and Karen Fichuk to its executive board. Henderson, currently CEO of Randstad Sourceright, will be responsible for global businesses, which include Randstad Sourceright, Monster, RiseSmart and Global Client Solutions, while Fichuk will become CEO of the group’s North American business. Linda Galipeau has stepped down as an executive board member to pursue her career outside Randstad. RUSSELL TAYLOR GROUP The technical recruiter welcomes Daniel Flack as regional trades manager for its London and South of England operations. SPIRE HEALTHCARE The independent hospital group has appointed Shelley Thomas as its new group human resources director. Romuald Restout joins the recruitment marketing platform as vice president of product. THORN BAKER GROUP The construction, industrial, facilities and maintenance staffing specialist has promoted regional director Rob Ford to head of construction, as well as formally appointing him as a group director of the group. Recycle your magazine’s plastic wrap – check your local LDPE facilities to find out how. to eight down to two. So give yourself a break on the morality of it. Humans are, well… only human. You can’t underestimate how difficult it is to go through this process of exclusion and then expect to achieve diversity at the other end. So the question is, how can you preserve the healthy variety of your candidate pool? Become mindful of bias Accepting that bias exists is far more fruitful than trying to weed it out. It’s not realistic to ask a person operating at the volume and complexity that recruitment often requires to do that without using some tools and techniques to support. Do unconscious bias training. Make everyone attend, including the C-suite. Ban un-diverse shortlists. Ban un-diverse interview panels. These are blunt interventions but they certainly accelerate cultural shift, if you can convince your leadership or client to put them in place. Be less human Someone faced with a big CV sift can’t help being tempted to cut corners, work fast and act on instinct. A study by theladders.com indicates that the average recruiter spends just six seconds reviewing a CV. It’s simply not long enough to think. I force myself to do a proper score card on each CV screen, even though it increases my workload. I’m a fan of the competency-based interview, a technique that drives focus on evidence rather than ‘chemistry’ or cultural ﬁt. And there’s a Chrome plugin that allows you to turn everyone’s LinkedIn photos into pictures of dogs – so you cannot judge candidates on their appearance. Sit-Stand.Com® | Standing Desk Megastore. #1 exclusive supplier of active office solutions including: sit-stand desks, desk risers, active seating & accessories. Official Partner to On Your Feet®.